Very sad but beautiful. Well done. Are you a professional illustrator? you reming me of dave B. Are you intrested in illustrating a book. Pls send answers to questions on my site. Hi Giles, thank you for your comment. Very nice and quirky stuff on your blog. Keep ’em coming. Also, Uli and Drazen, I am honored by your encouragement. Your blogs and art work are an inspiration to me. this elephant looks so sad up there. i really love the birds’ movment in the background. it is all very prettily done. Really great work! Bold, simple and colorful. Thanks for checking out my blog! woooow I’ve just discovered your blog! (sure I’ll be back!) lots of great illos. Remote one looks bright, love the clouds’ shapes and that character! The mountain peak is also powerful and brilliant. I love this…he’s an adorable elephant, but he looks so lonely! You did a great job in illustrator, and the colors are really pretty. I love the birds in the sky…transluscent and fleeting! Hi Giles! Thanks you for your comment on my blog and for the link! Very much appreciated! You have some great work on your blog! Looking forward to more posts! ha!! this is so funny!! LOL this is tooooo funny! I like how you tell how high the elephant is with the ear-muffs and the birds. It is very charming and well done! nice drawing! poor ..itÃ‚Â´s alone and without a companion but i think itÃ‚Â´s happy ,taking into account itÃ‚Â´s listenning to music! !, nice blog!!! kisses. Love your illustration! Great design and sense of color. I like ur colorschemes!they r very pleasant.I liked the form of tree in ‘Gronky in Autumn ‘. Your skills with the illustrator is in excellent conditions :)..
Nifty animated header at the top of your blog. I love your work and style. Do you animate your characters as well? Smook, thanks ever so much for visiting my Blog and for your encouraging feedback. 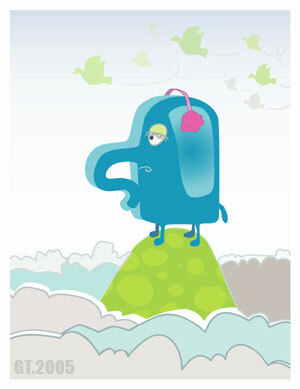 Nice illustration for “feeling remote”. (Especially for elephants who tend to be more social creatures. Great choice for this!) I love his ear muffs. Charming character and great colors. Thanks for positive feedback at my journal. I love your remote elephant. i’m flattered that you visited my site. though i love the elephant, i especially dig those birds in the background! your stuff is wonderful; i love the names of all your characters! I like the palette in this piece. Nice juxtaposition of bright colours and a sad expression on the elephant’s face. Love the illustration – looks like Nowhere Man’s pet elephant. Is it an island or a mountain above the clouds ? Nice illustration. chad, thanks for stopping by and for the comments. duncan, thanks for the feedback. I meant for it to be a mountain top above the clouds.